We’ve been using Airbnb to find accommodation on and off throughout the trip and it’s been especially useful for finding apartment rentals for a few weeks as it’s really nice to have a kitchen and a bit more space than the average hotel room. Another option is to rent someone’s spare room, which at its best is basically living with locals in a local neighbourhood. 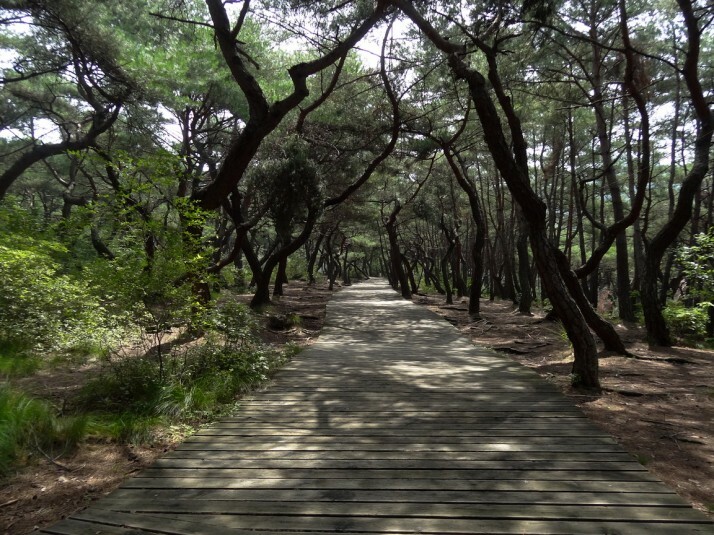 This is what we opted for in Daegu and we felt like we’d struck gold staying with lovely Gabby and Andrew. 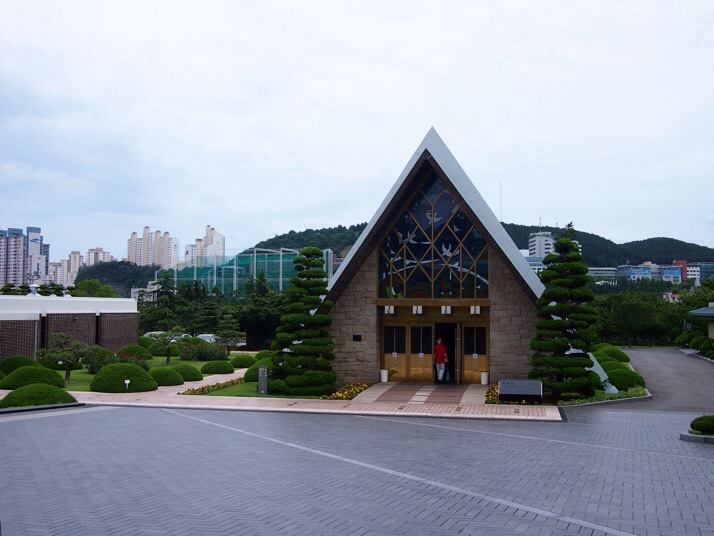 On our final evening we all had takeaway fried chicken and beers sitting in their living room watching Korean soap operas – it doesn’t get much more homely than that! Halfway up the hill there was a heavy shower which we were able to shelter from in a rest pavillion before continuing upwards through the damp air and dripping trees. 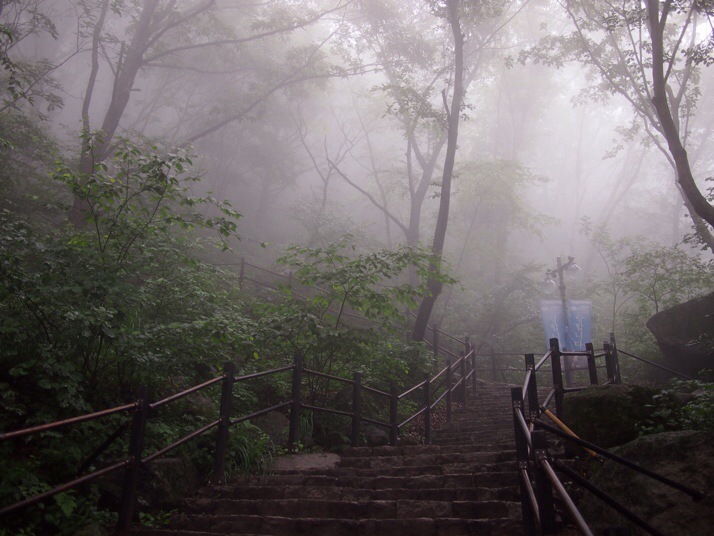 The stairs were unrelenting with no flat sections at all but it wasn’t far really and we soon arrived at the shrine. 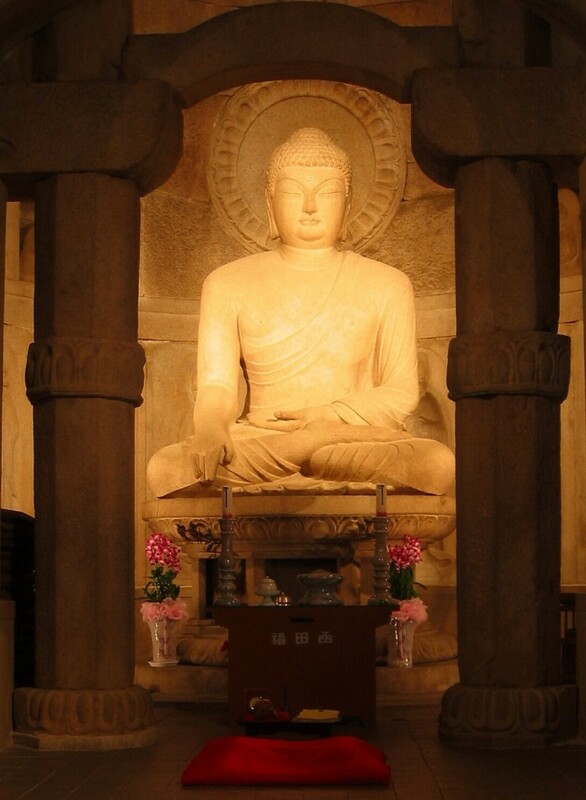 The Buddha statue is carved from a single piece of stone and its official name is ‘Stone Seated Medicine Buddha’, but he is popularly called ‘Gatbawi’ which means ’Buddha of the Stone Gat’ (the traditional wide brimmed Korean hat) referring to his very obvious headgear. The view might have been fabulous but all we could see was cloud and then it started to rain again. This time it was more than just a shower and the tarpaulin over the bowing area wasn’t really keeping the wet out anyway so we decided to head back down the hill. The Lonely Planet said there were two routes between the bus stop and the shrine, we opted for the non-step route for our return. It wasn’t any easier going, if anything it was harder as the path was sometimes rocky and slippy in the wet which required more care than the reasonably regular steps. Eventually we reached a crossroads with signs pointing off to different temples in each direction. The name of the one off to the left rang a bell, but that made no sense at all so by mutual agreement we set off on the path heading down the mountain. Of course, what we should have done was consult the photo of the trail that we took at the bottom of the hill and match up the Korean symbols with the sign, but it was raining, we were wet and trying to juggle camera and umbrella without getting more wet was too difficult so we just set off plodding downhill. After a while we rounded a corner to arrive at a car park and (closed) information point. It was clear that we were in entirely the wrong place and to make matters worse, the trails marked on the map in the car park, the photo we’d taken of the map at the bus stop and our memory of the crossroads didn’t tally up at all. We ate our lunch on a wet seat before trudging back up the hill to the last temple we’d passed to see if we could work out how to cross the ridge. 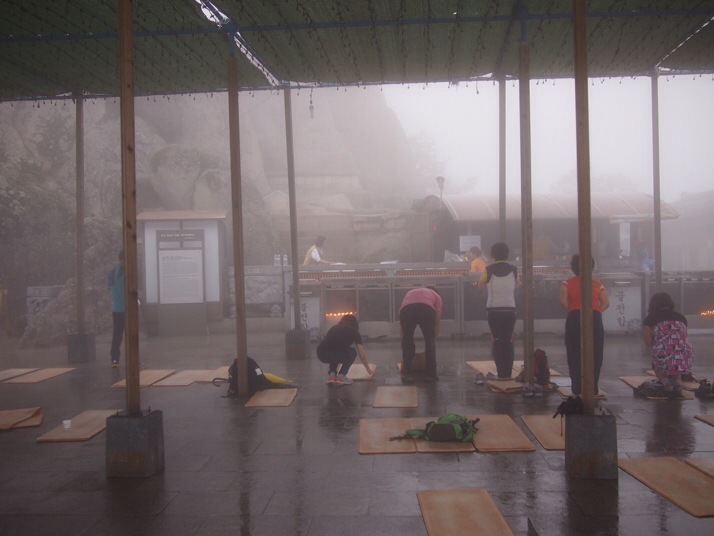 Fortunately the rain had more or less stopped and it didn’t take long to arrive at the seemingly deserted Yongjuam temple. After admiring the bell and ruing the lack of view due to the still massed clouds we thought to pass by the main hall in search of a trail down the other side; cue very loud barking dogs who obviously were not keen on letting us past. 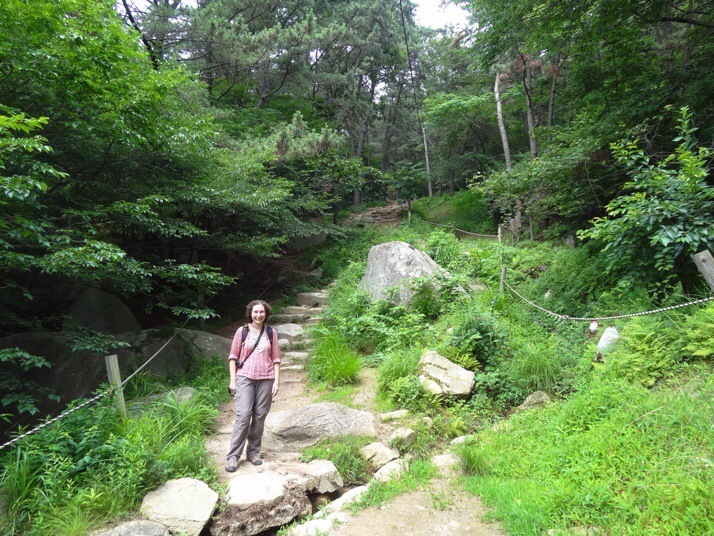 At last a groundskeeper appeared, shouted at the dogs and pointed out the trail to Gwanamsa temple from where we could pick up the original path down to the bus stop. 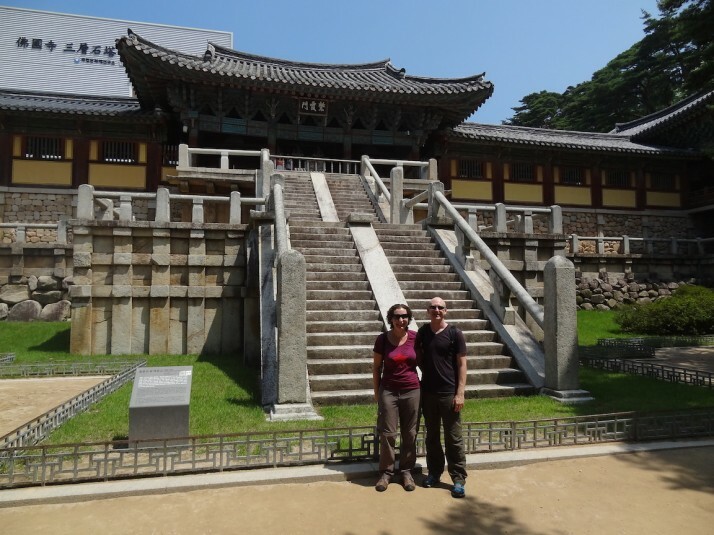 We were very glad to spot Gwanamsa temple at last! The supposed two hour round trip hike took us more than four hours, it’s a good thing we didn’t need to be anywhere else that afternoon! 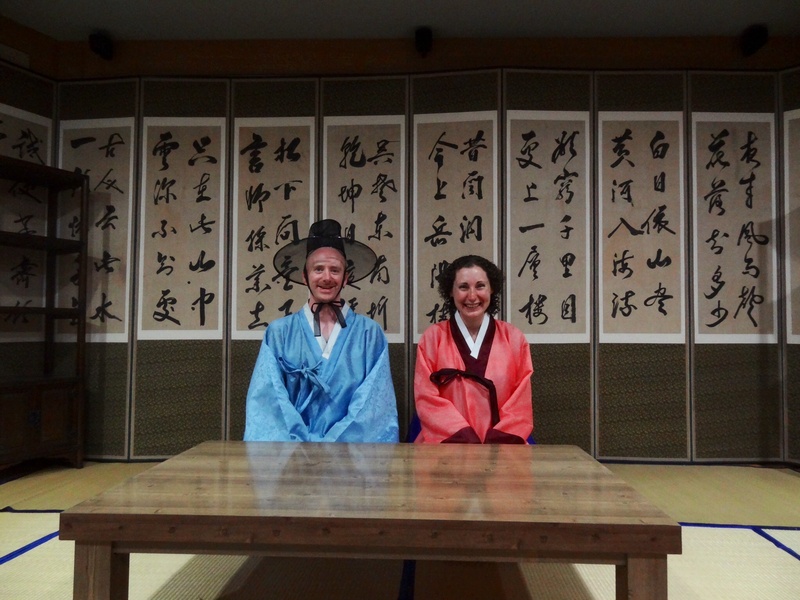 On our final day, we spent the morning chilling in a traditional Korean bathhouse before meeting Gabby for lunch at Seomun Market. 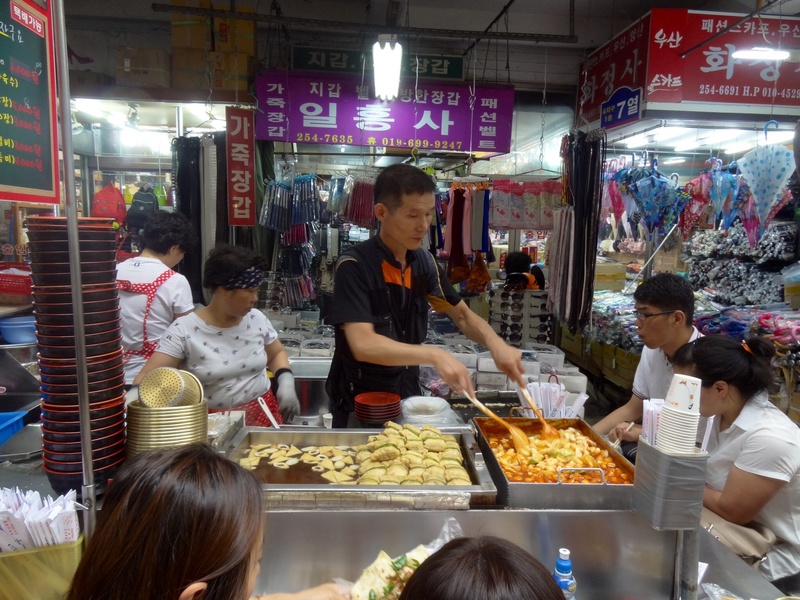 She took us to “the best” food stall to sample tteokbokki, noodles and pancakes. 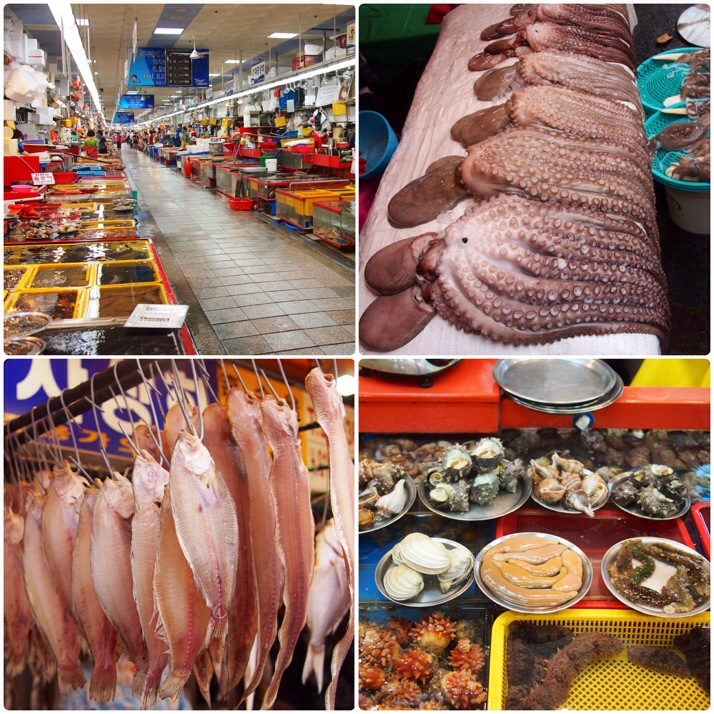 After the delicious lunch we wandered through some of the stalls. Saturday afternoon is probably the busiest time of the week and it was packed. I was surprised that many of the clothes shops had an almost boutique look to them, much more upmarket than the clothes usually for sale in markets in England. 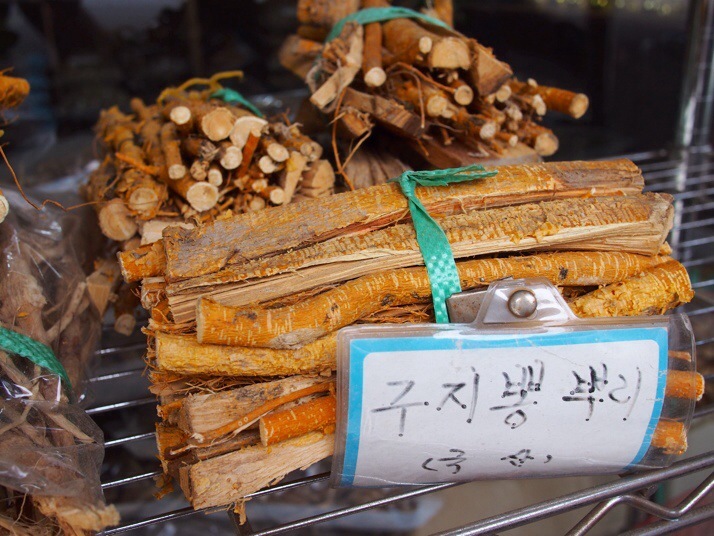 Daegu is well known in Korea for its traditional medicine market. This dates back to the 17th century when the king decreed that a medicine market should be set up there. It wasn’t quite what we expected. I thought it would be a big covered hall with shops and stalls (like a regular market) but it’s actually a couple of streets in the city centre which are lined with shops selling herbs and offering traditional medical services such as acupuncture. A look through one of the shop’s doorways. 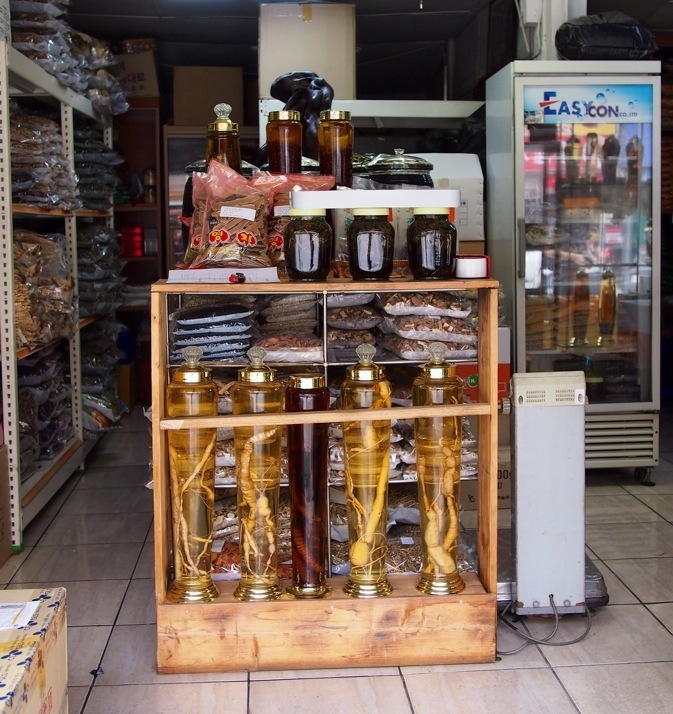 The large glass jars contain ginseng, a vital ingredient in many Korean herbal remedies. 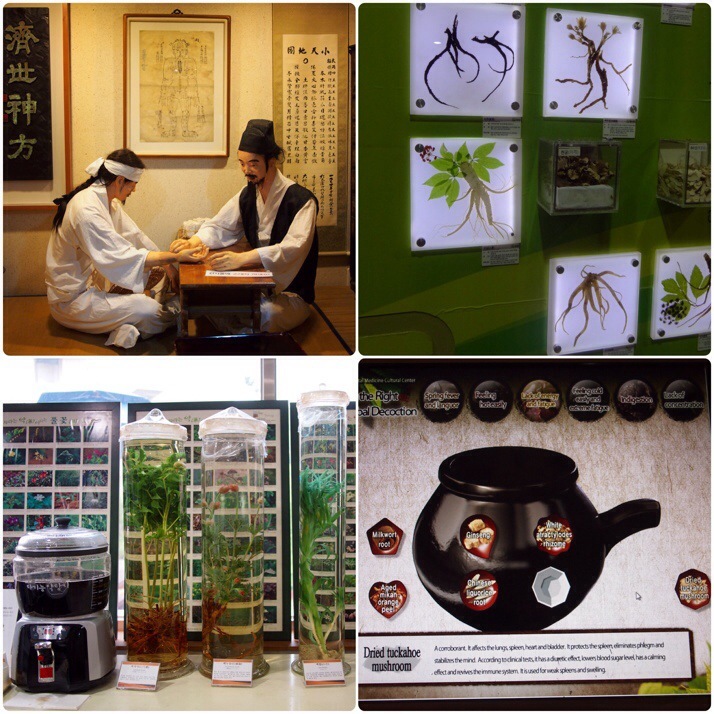 Yangneongsi Oriental Medicine Museum is just off the market’s main street. It is nicely set up but has essentially no English signage so the friendly lady on reception gave us a tour in broken English. It begins with a few dioramas showing the history of the area, followed by an overview of the different plants (and animals) used in the remedies, and some scary looking acupuncture needles. On the lower floor was an interactive space where quiz machines would work out which of the four body types you are, and we learnt how to make remedies, as well as being able to try a small cup of herbal medicine tea (quite tasty!) and try on a traditional hanbok. Us in traditional Korean hanbok. It’s unclear what link this has to traditional medicine but it was a fun activity. The hat Andrew is wearing is the ‘gat’ which the Gatbawi Buddha is named after. 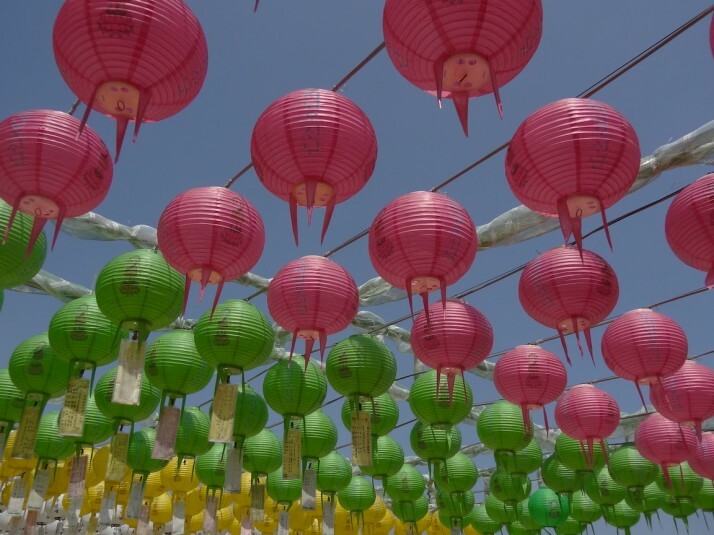 This entry was posted in Places and tagged Daegu, Market, South Korea, temple on July 30, 2014 by Julie. 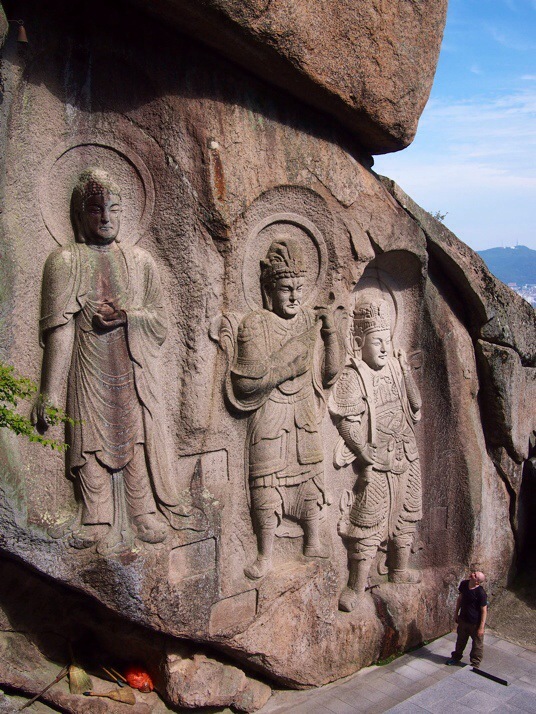 Gyeongju was once the capital of the long-lasting Silla dynasty which started in 57 BC, ran for almost a thousand years, and grew to rule most of the Korean peninsula. 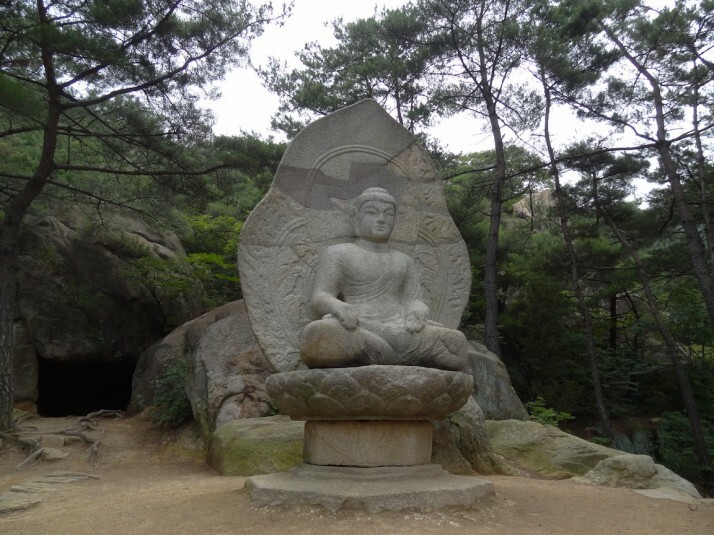 Often described as a ‘museum without walls’ the area in and around the main city has more palace ruins, burial mounds, rock carvings and Buddha statues than anywhere else in South Korea. With so much to see, it was tough to decide where to spend our time.. The tumuli, or burial mounds, were a lot bigger than we thought they’d be, and the many open parks to the south of the city are full of them. Their size denotes the importance of the person buried inside, and while some have been looted or excavated over the years, a lot of them have been left untouched. 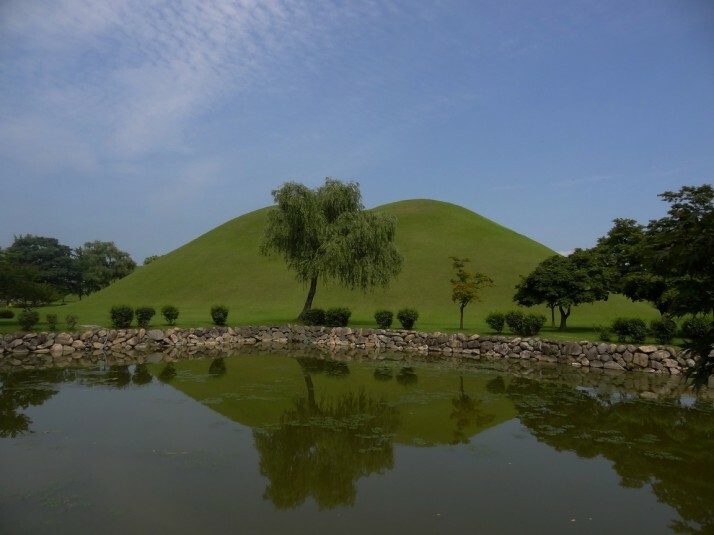 In the Daereungwon Tomb Complex, the highlight is the Cheonmachong tumulus – half of the mound has been hollowed out so you can see the construction from the inside. 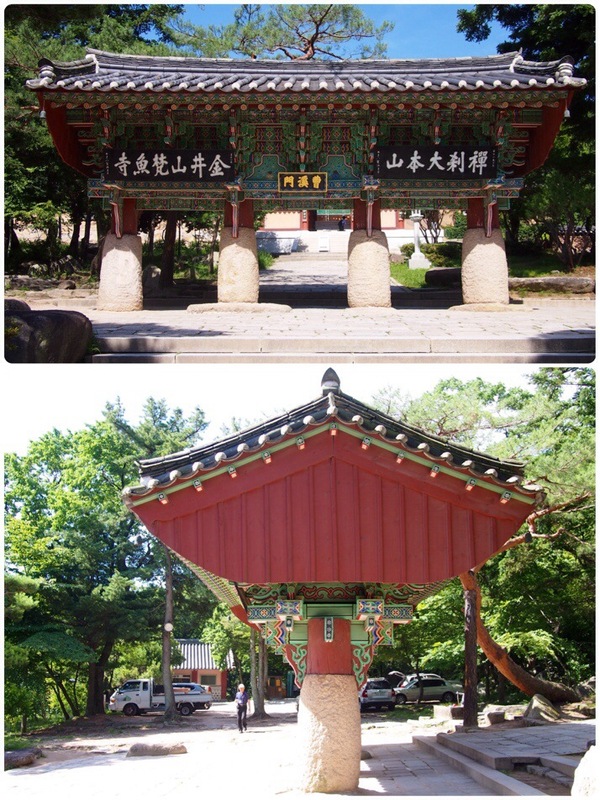 In this tomb, believed to be that of an unknown Silla King, the body was laid east-to-west, surrounded by a large, thick wooden coffin, which was covered in rocks, then covered in earth to form the mound. 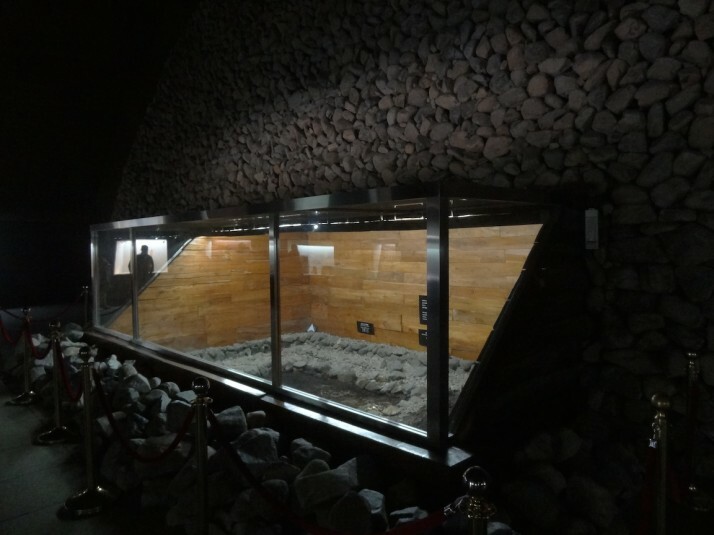 Replicas of the items buried with the King are on display, including a piece of his saddle that depicts a flying horse which gives the tumulus its name. 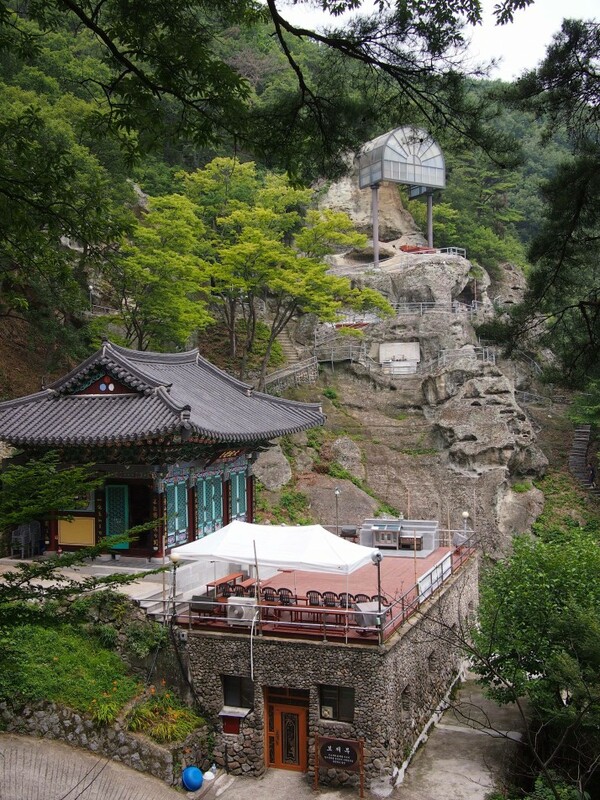 Just next to the tumuli is the Cheomseongdae Observatory. 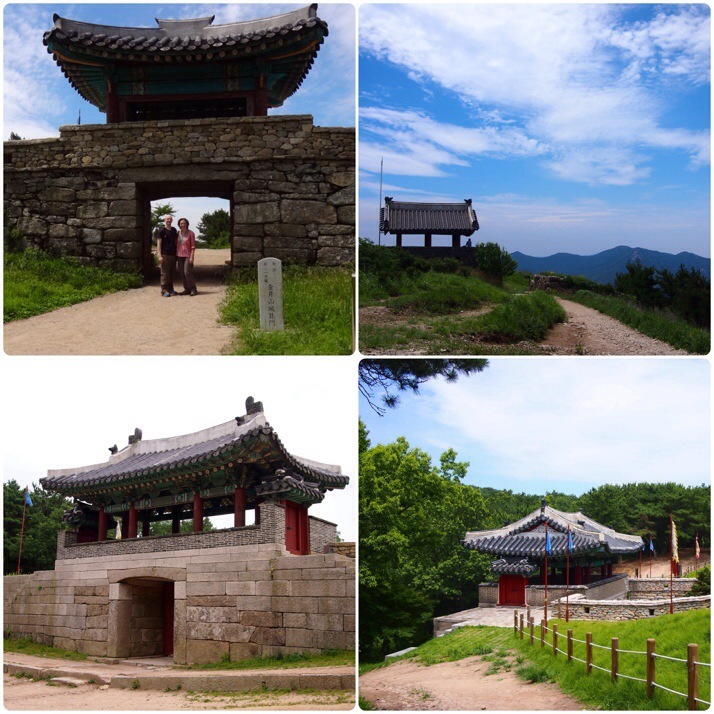 Built around 632~647, it is the oldest astronomical observatory in East Asia. 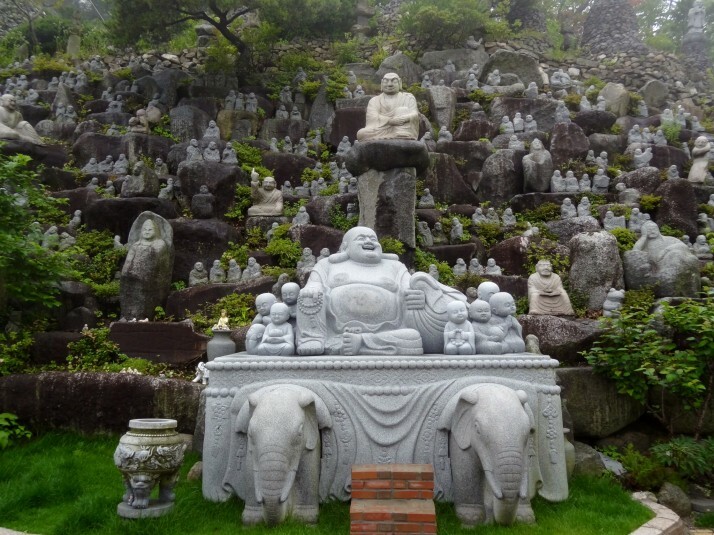 It has 12 main stones forming the base – 1 for each month, 30 layers – one for each day of the month, and is constructed of 366 stones – one for each day of the year (OK, they’re one or two off!). Unlike the tumuli, we were expecting the tower to be a lot bigger than its description belies! Still surrounded by tumuli (yes, there are a lot of them! 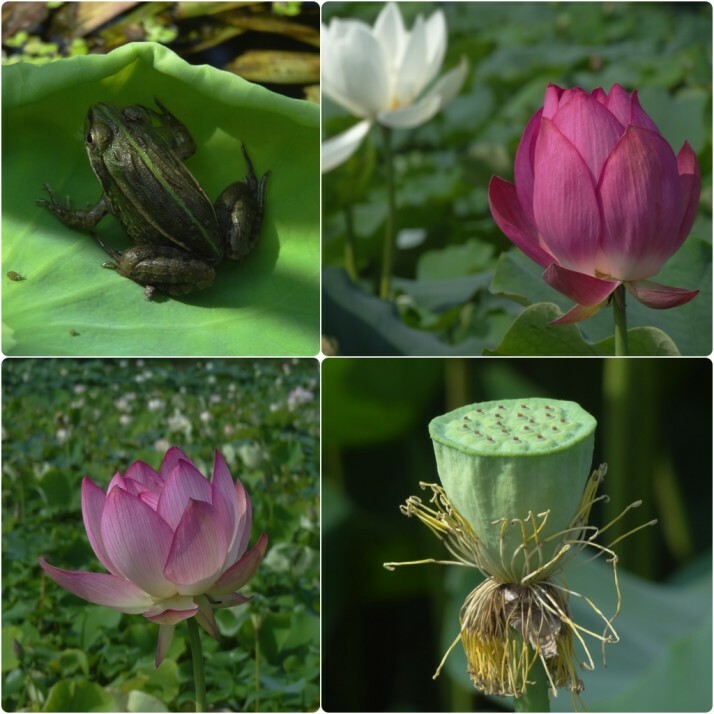 ), are several lotus ponds. We were just a little late to catch them at their best, but we were just in time to see the tadpoles turning into itty-bitty frogs! 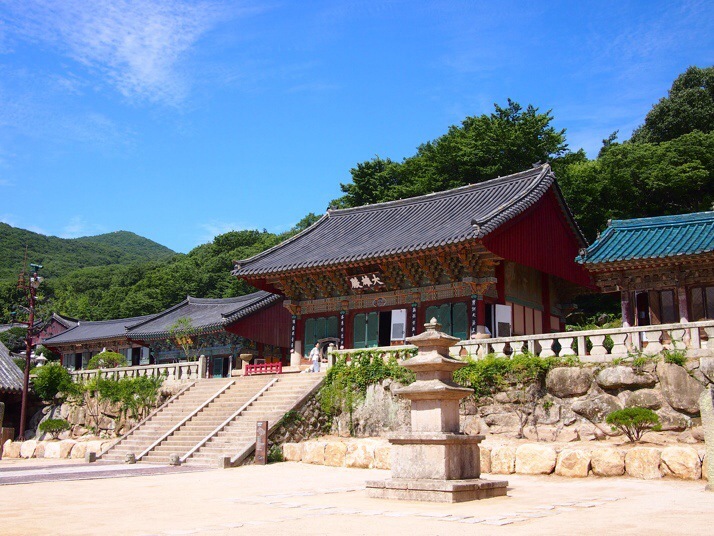 Bulguksa temple is on the UNESCO World Heritage list and if that isn’t reason enough to visit, it’s also listed as a national Historic and Scenic Site and home to a number of designated national treasures as well as being the head temple of the 11th district of the Jogye Order of Korean Buddhism! 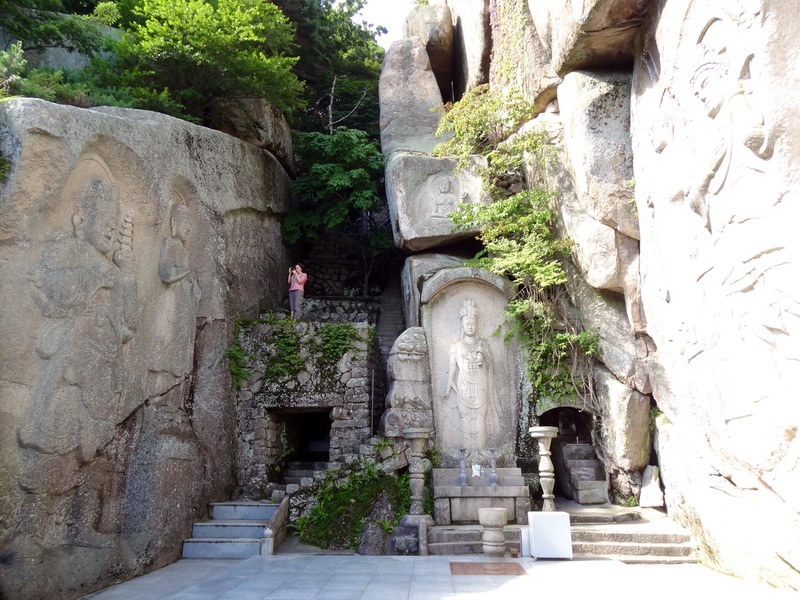 We arrived by bus and made our way up the steep winding pathway and through the lovely landscaped pond area to be greeted by the two magnificent stone staircases that lead up to the temple. 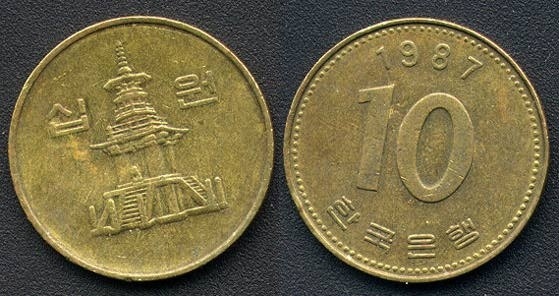 In the main courtyard are Dabotap and Seokgatap – a pair of stone pagodas that are national treasures, one of which features on the ₩10 coin. 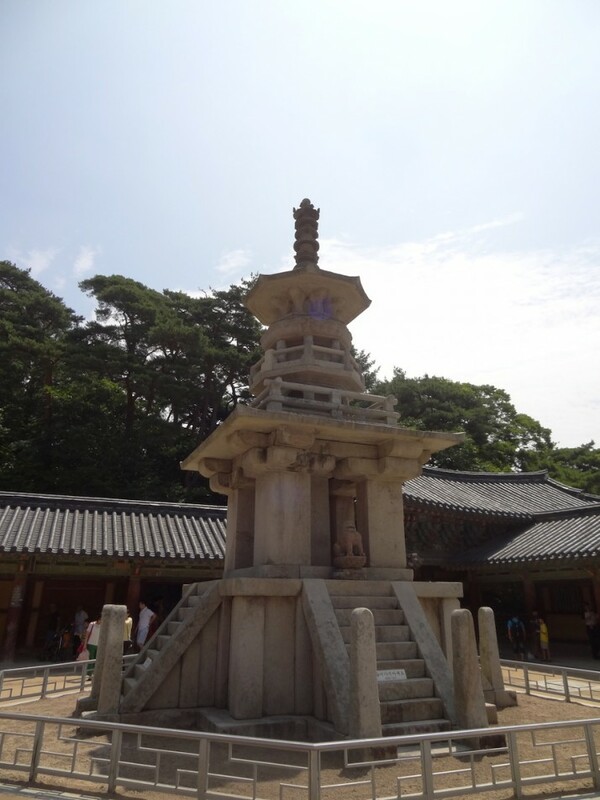 Bulguksa temple is beautiful. 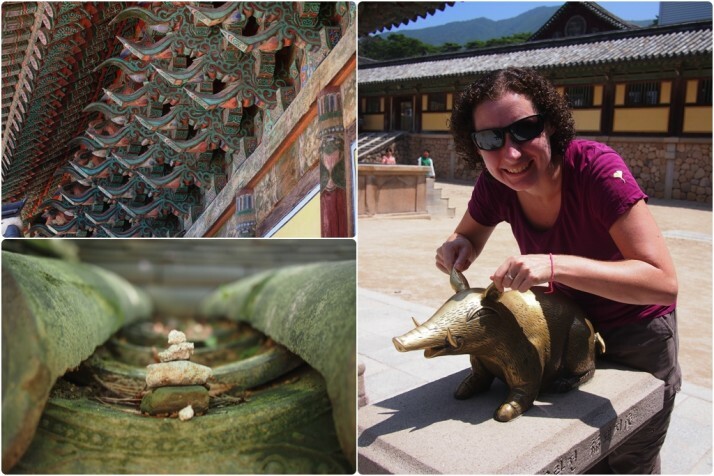 We especially loved the brightly painted eaves and the separate courtyards that had their own distinctive styles – particularly Nahanjeon which was surrounded by little piles of stones, and the surprise of a finding a bronze pig in front of Geuknakjeon! 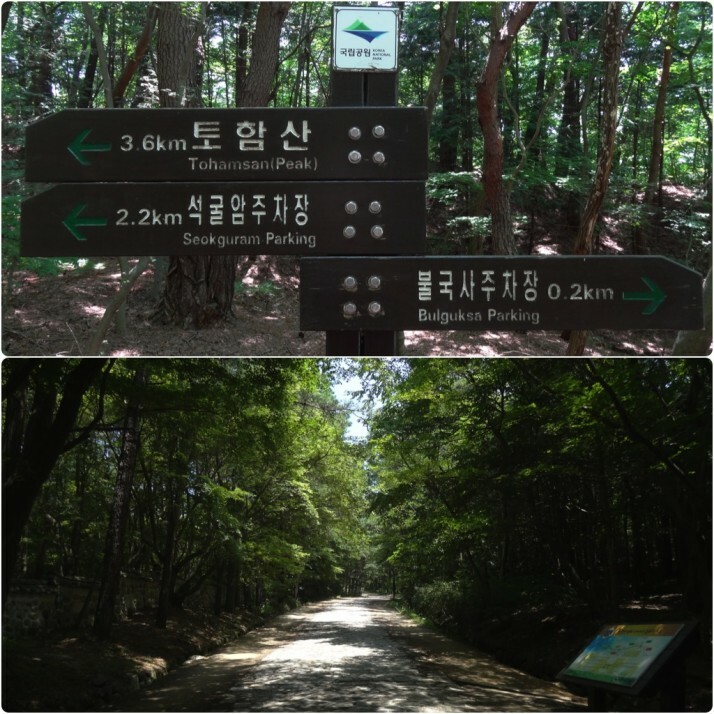 From Bulguksa, we made the short hike through the forest to the Seokguram Grotto.. 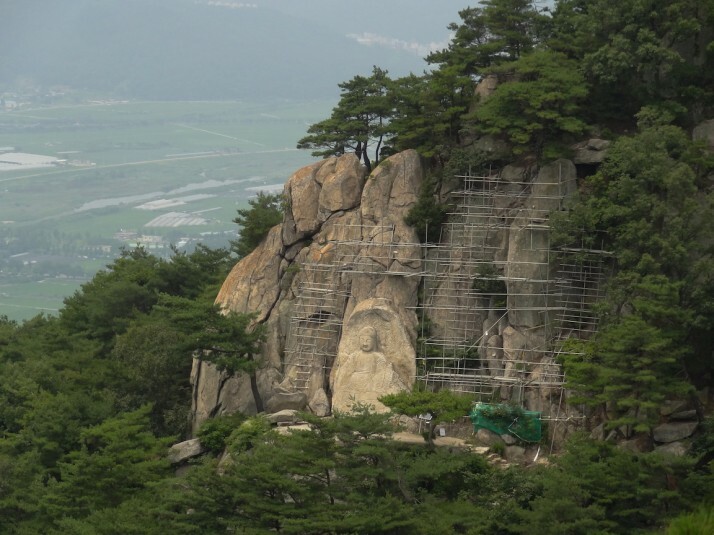 The Seokguram Grotto was completed in 772 and is home to a large stone sculpture of the Seokgamoni Buddha, the historic Buddha at the moment of enlightenment, which is regarded as one of the best examples in the world. 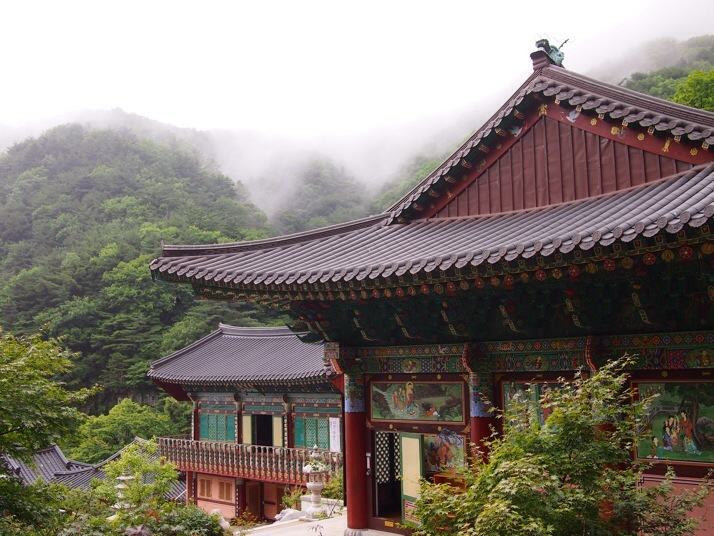 The Golgulsa temple is the home of Sunmudo, a Korean martial art practiced by Buddhist monks initially as a method of dynamic meditation, and later revived to help repel invasions from the Japanese. Set in a valley up the the side of Mt. 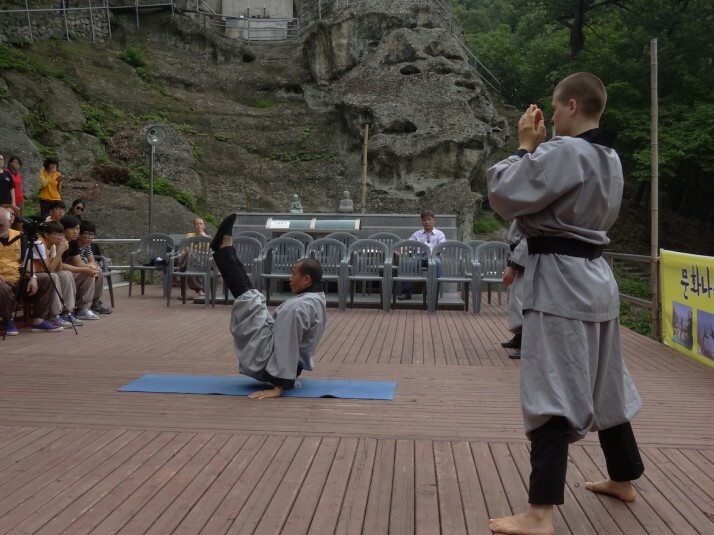 Hamwol, the road through the grounds gets progressively steeper, and culminates in a hillside temple with an outside training area and display platform where demonstrations take place. 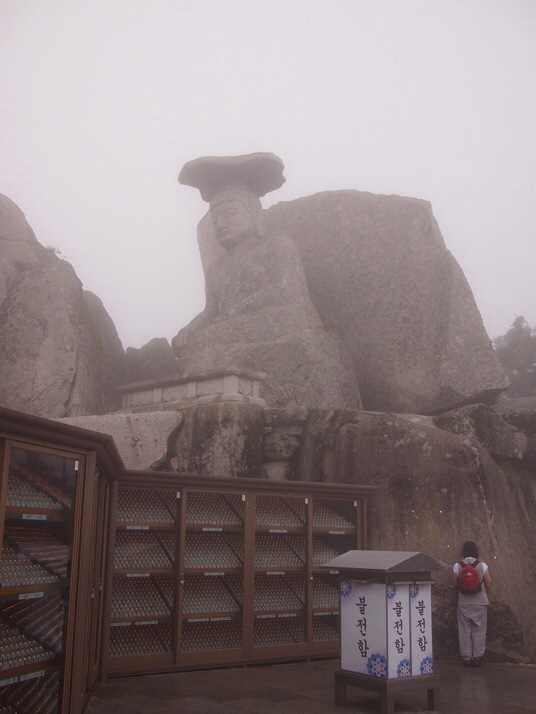 As we had some time, we climbed up to see the Buddha carvings, and watched a chanting monk in Korea’s only cave temple. 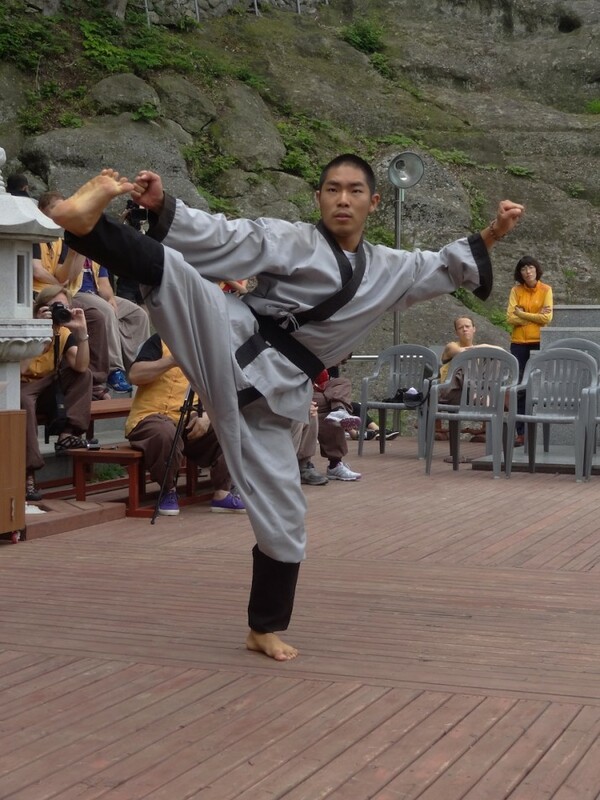 Every day at 11am and 3:30pm (except Mondays), students of the temple give a short demonstration of their skills and flexibility, which was very impressive indeed! 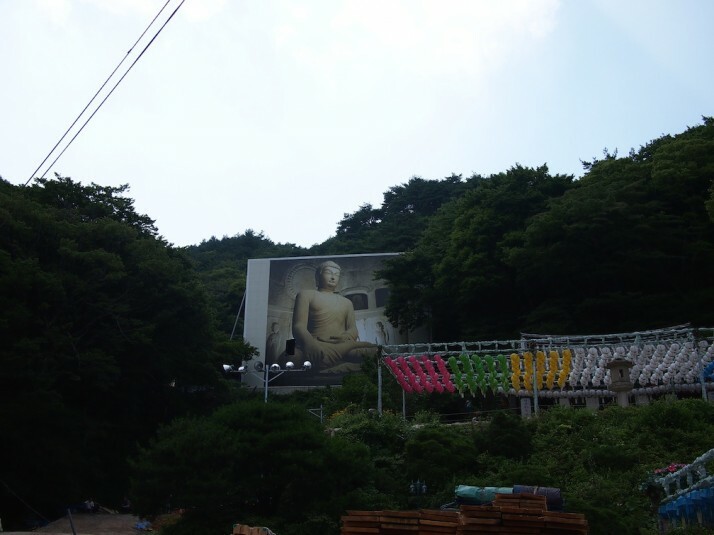 The head monk’s routine looked more like Ashtanga yoga to our eyes, and in his Korean speech afterward we heard him say ‘yoga’ a few times. It made us want to take up our practice again.. 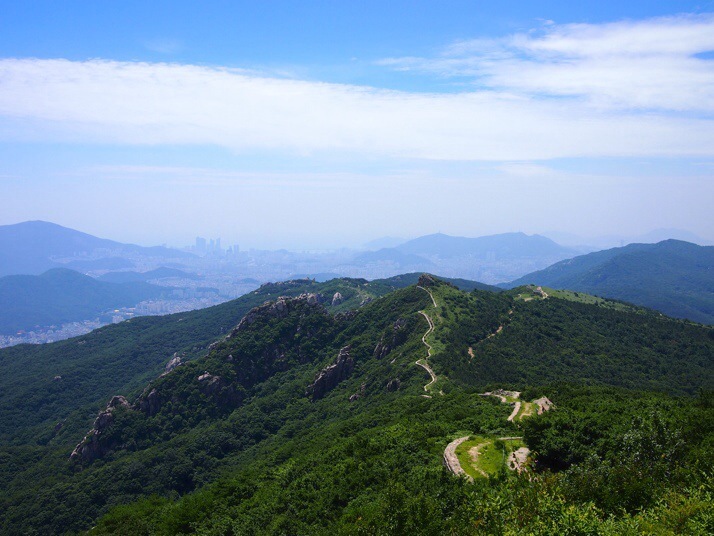 While the whole of Gyeongju befits its description of a ‘museum without walls’, we agree with Jim Cheney’s sentiment that nowhere in Gyeongju is this truer than the Namsan mountain range. 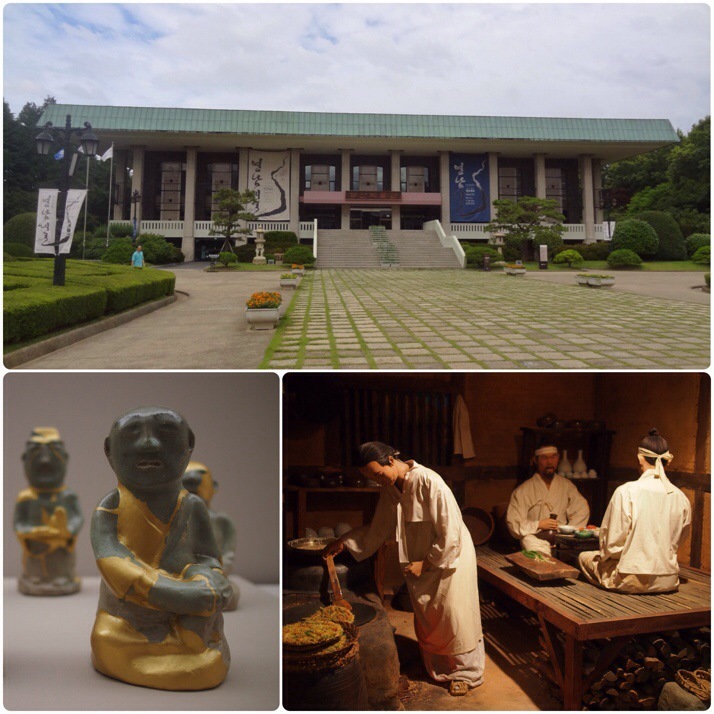 The range itself is 8km by 12km and contains various artefacts thought to date from the Silla period. 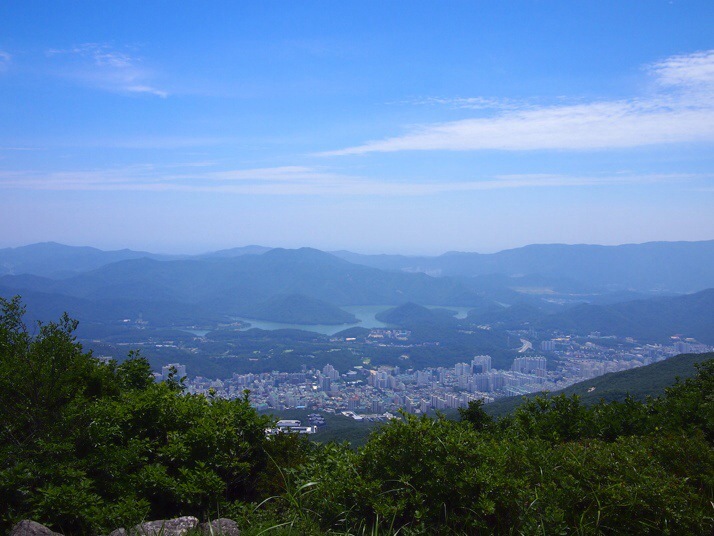 We chose a simple yet steep climb up the Samneung Valley to the top of Mt Geumobong (468m high), and down the Yongjanggol valley on the same side of the Namsan range. The start of the path in Samneung Valley. Just around the corner it got very steep, very quickly! 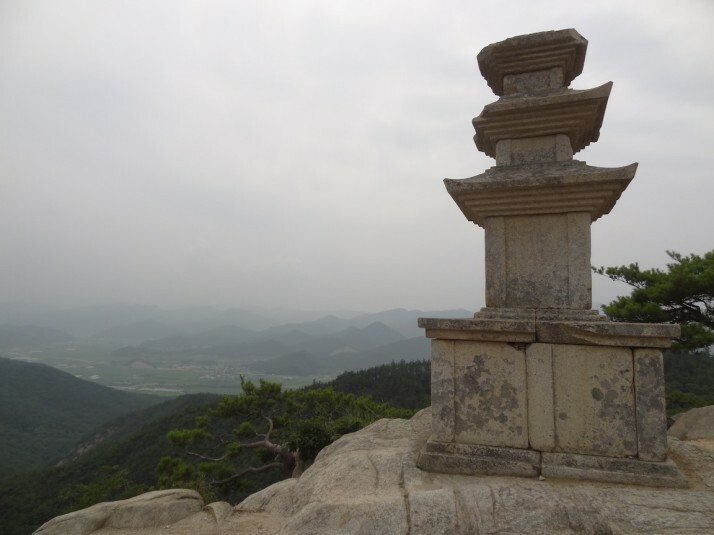 I don’t think it would have mattered which path we chose, it seemed like every few steps there was a signpost directing us left or right a few metres to some carving, statue or other point of interest. Not only was it great to see so many works of art in such close proximity (and without barriers or ropes), but it helped break up the hike so it didn’t feel so strenuous! 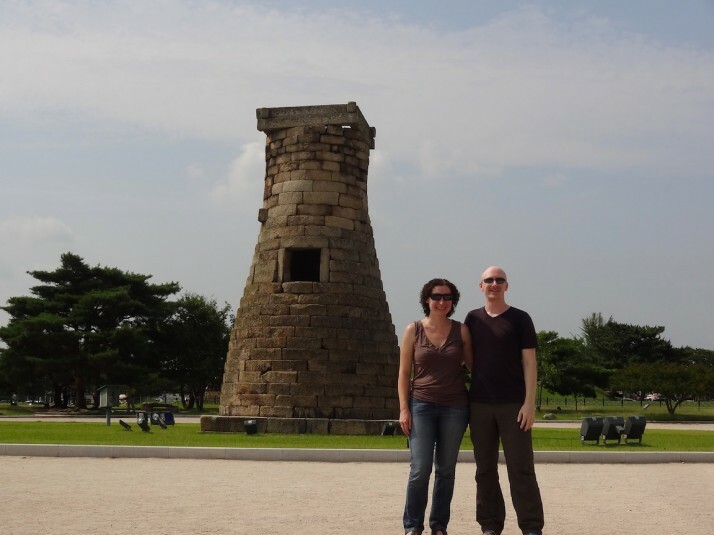 We were only in Gyeongju for a few days and we packed quite a bit of sightseeing in. We’re glad we did – there’s so much to see here and having a lot of it outside is a welcome change from air-conditioned museums! 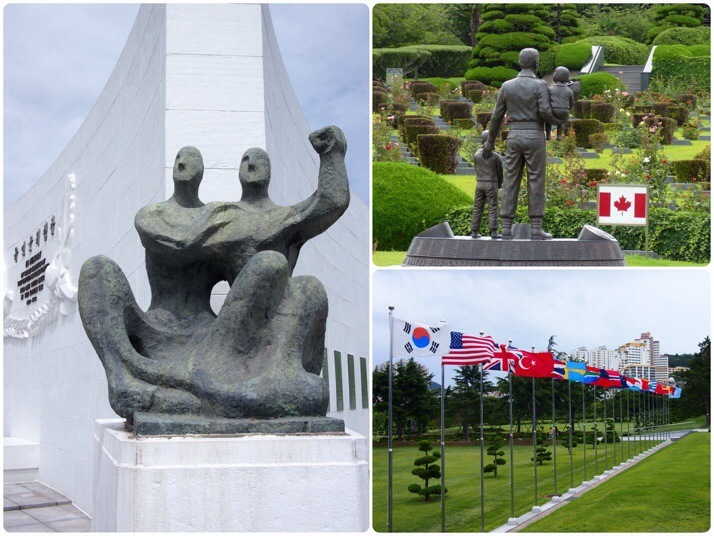 This entry was posted in Places and tagged Gyeongju, South Korea, temple on July 28, 2014 by Andrew. What photo takes you right back to Japan? 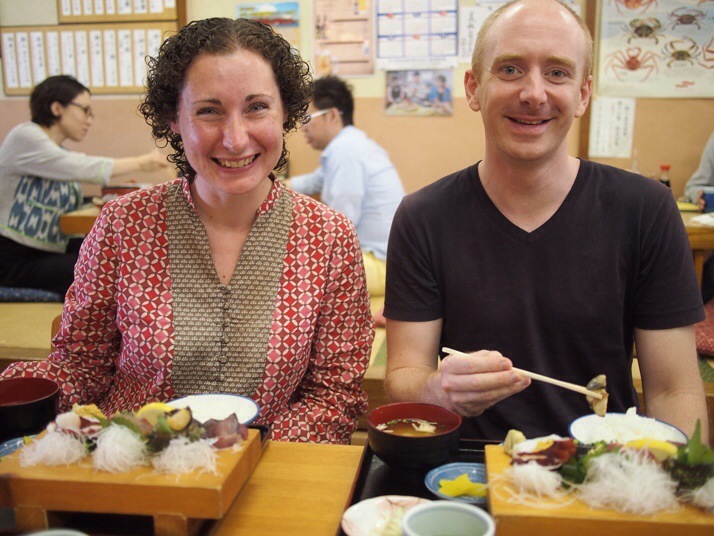 We were really looking forward to the food in Japan and it didn’t disappoint. 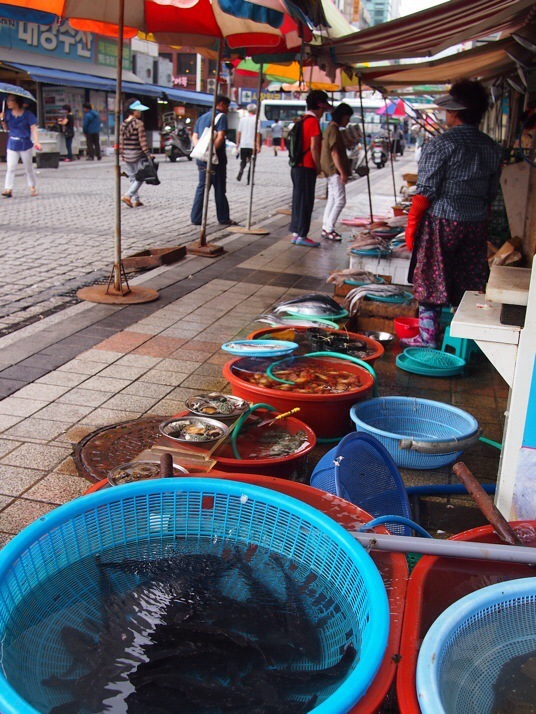 The fresh seafood in particular was superb. Eating sashimi for breakfast at the fish market in Kagoshima. Summarise Japan in three words. Delicious – “Oishi” was one of the handful of Japanese words that we learnt and it was used often, to the delight of restaurant owners. 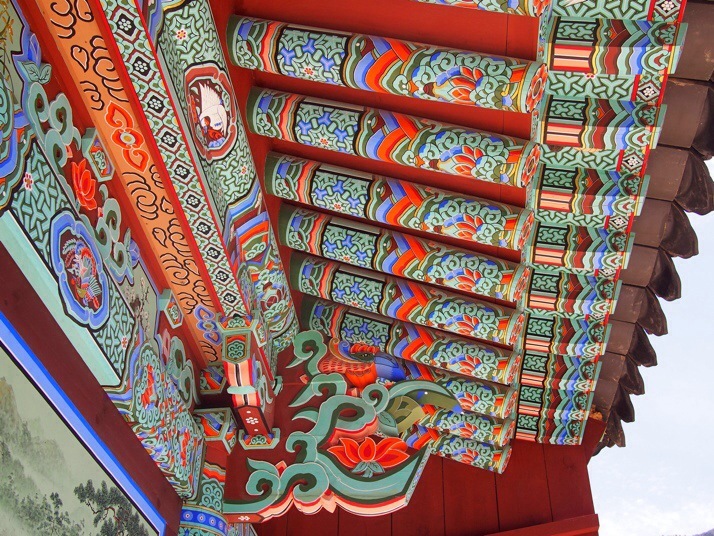 Contrasts – From ancient temples and shrines to bright lights and high-tech, from densely populated urban areas to completely unpopulated areas of natural beauty, Japan is definitely a country of contrasts. Omotenashi – This word which means Japanese hospitality really sums up our experience of the Japanese. When we were in Russia, we remarked on the generosity and kindness of its people, in Japan it seems that everyone is trying to make sure you have a good impression of the country, from old ladies who pressed sweets and biscuits on us, to men in bars ordering us food and drinks, to the overwhelming helpfulness of just about anyone who we asked for help. …you’re looking at one of the top three “something” in Japan. I don’t know whether it’s a mixture of modesty (not wanting to declare themselves the best) and boastfulness (really thinking that they are the best) or a love of order that ranks everything into lists, but it seemed like every sight we visited was ranked in some way although it was rarely stated what order or what the other two were. The most memorable example that we saw was the Ohkonotaki Waterfall on Yakushima – ‘one of the top one hundred waterfalls in Japan’ – seriously, who compiled that list?! What one item should you definitely pack when going to Japan? Walking shoes. 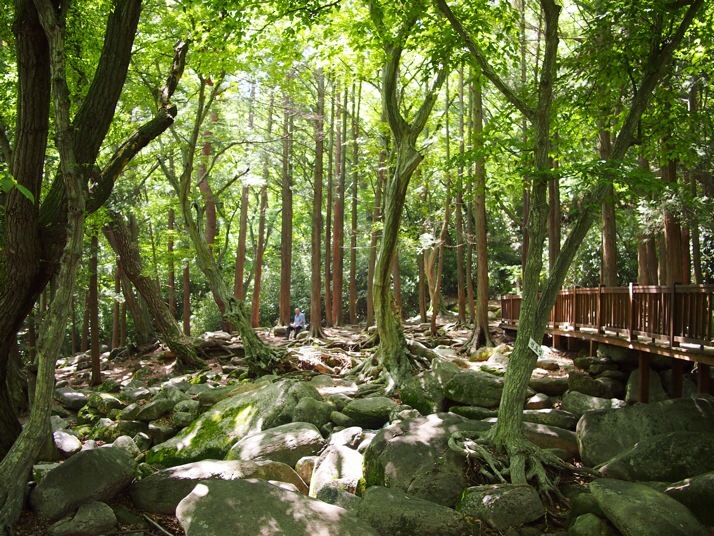 We were both surprised by how many outdoor activites we found in Japan and how accessible they are. 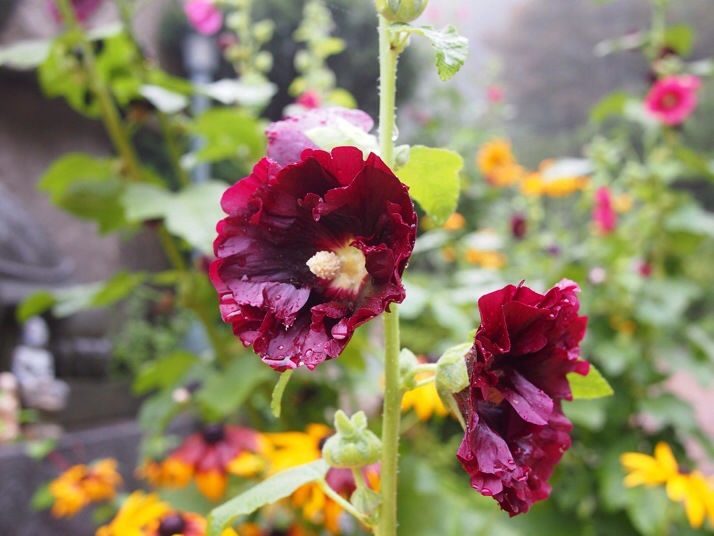 This entry was posted in Places and tagged Japan, Round Up on July 20, 2014 by Julie. One of the best things about travelling is noticing the differences. In many ways Japan is similar to the U.K. which only added to the contrast when we spotted the weird and the wonderful. Without further ado, here’s a random list of things that made us smile during our 3 months in Japan.. There are drinks vending machines on just about every street corner. Sometimes they stand together in pairs and have staring contests with the pair of vending machines on the opposite corner. 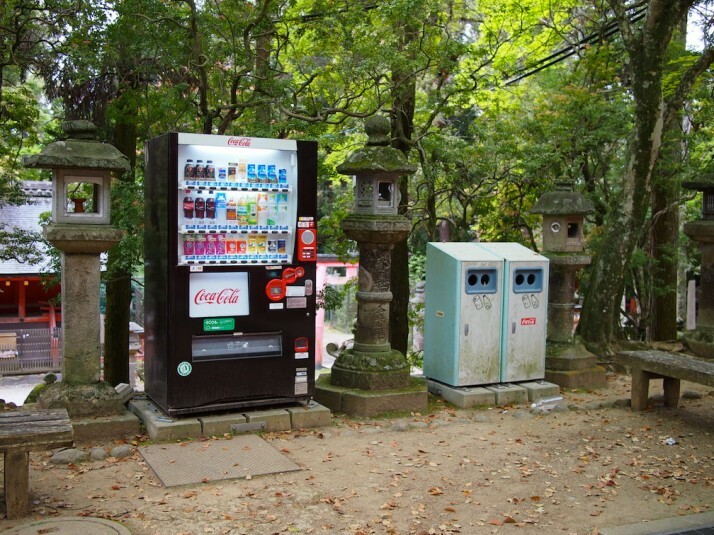 Vending machines have taken over Japan. 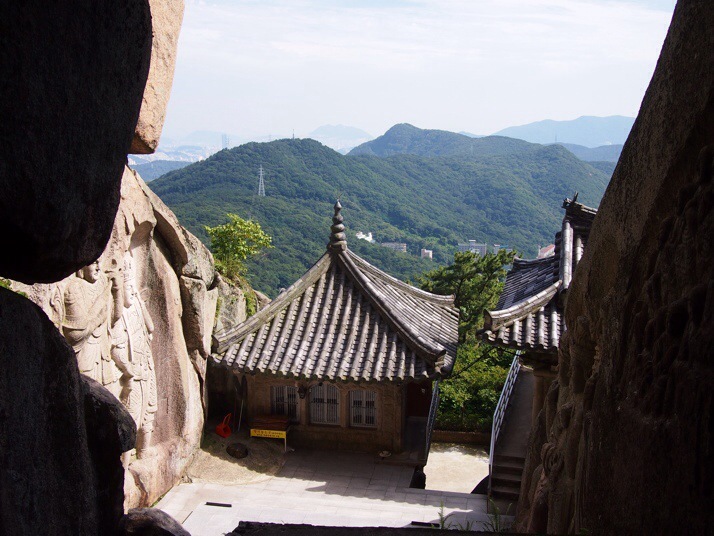 This one was lurking at a temple, and they even climb mountains. Rumour has it there’s one at the top of Mt Fuji..
Japan is a very clean country, but you’ll rarely see a litter bin. There are bottle bins next to most vending machines, and we occasionally found recycling bins, but public cigarette ashtrays are more common than general waste bins. We later learned that the Japanese thinking is this: rubbish bins attract rubbish. 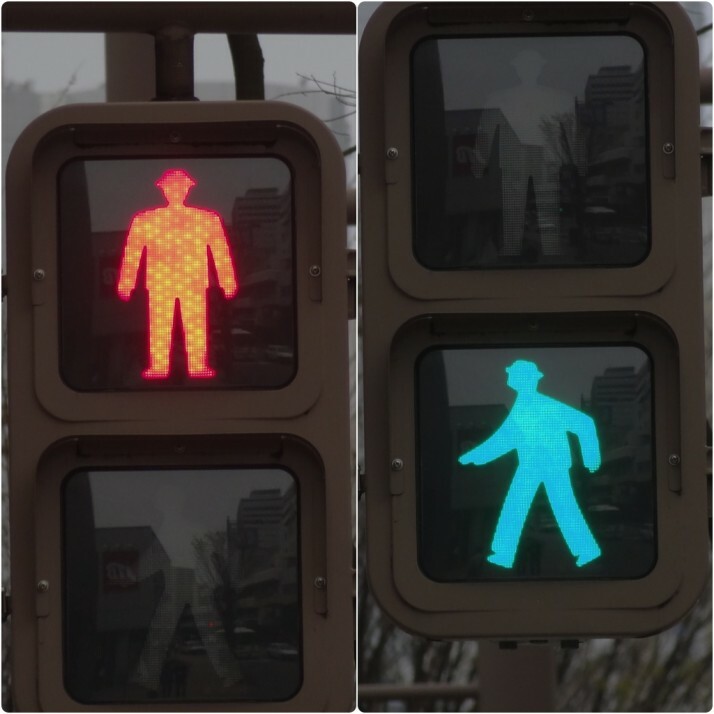 The red and green men at pedestrian crossings are smartly dressed and wear hats. Train guards bow when entering each carriage, and turn to bow again before leaving. 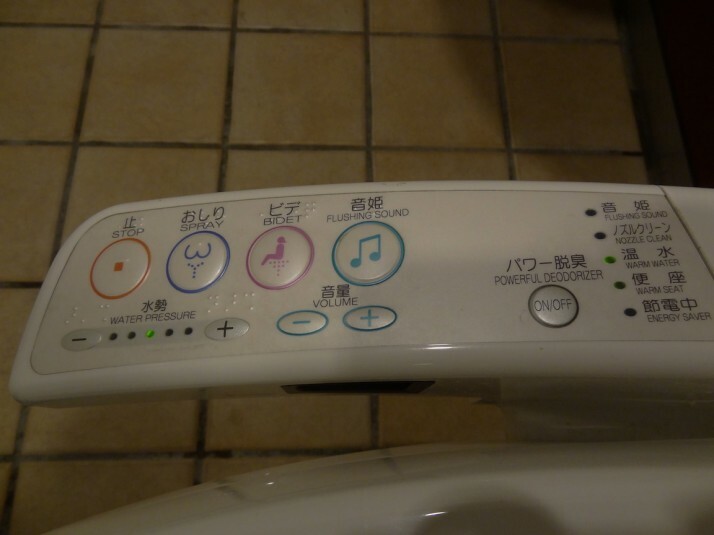 Toilet seats are heated and often include bidets and spray functions. 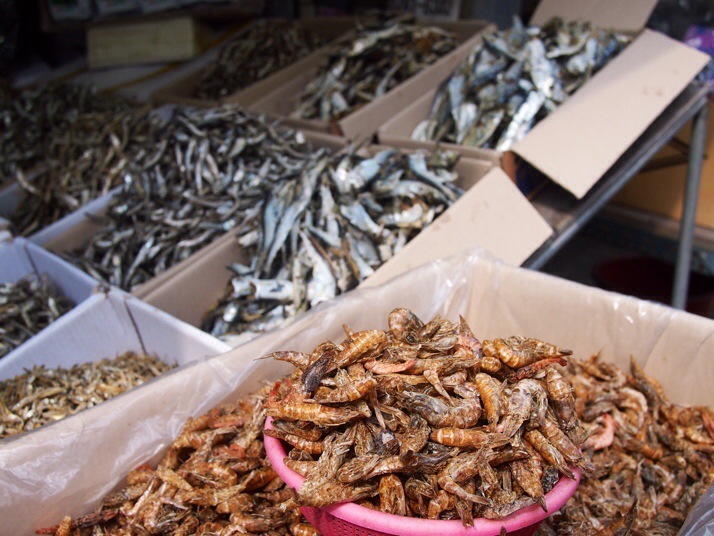 This should be the standard across the world – they’re fantastic! Speaking of toilets, bathrooms often have their own slippers to save getting your normal slippers (or socks) dirty, even some public bathrooms in palaces, temples or shrines! 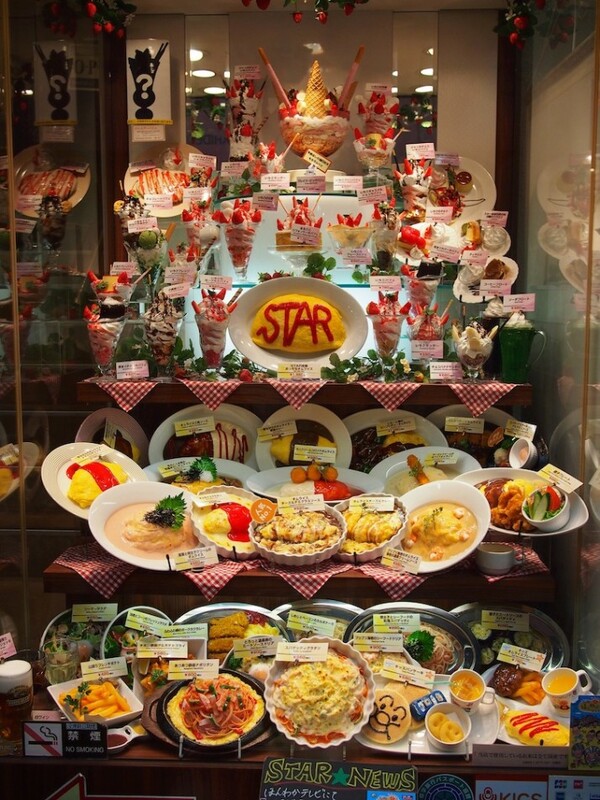 Most restaurants don’t have English menus, but it doesn’t matter because either the menus have pictures or there’s an elaborate display of fake plastic food outside. Note that the more expensive food is generally pictured in menus and the translated menu may not have all the choices of the Japanese version. “Hai” means “yes” in Japanese, but it’s used so frequently that it’s more akin to “yep”, “OK”, and “right” or “correct” in English. Ink stamps are everywhere. Every museum, historic point of interest and hiking trail will have at least one custom rubber stamp on a chain with an ink pad. 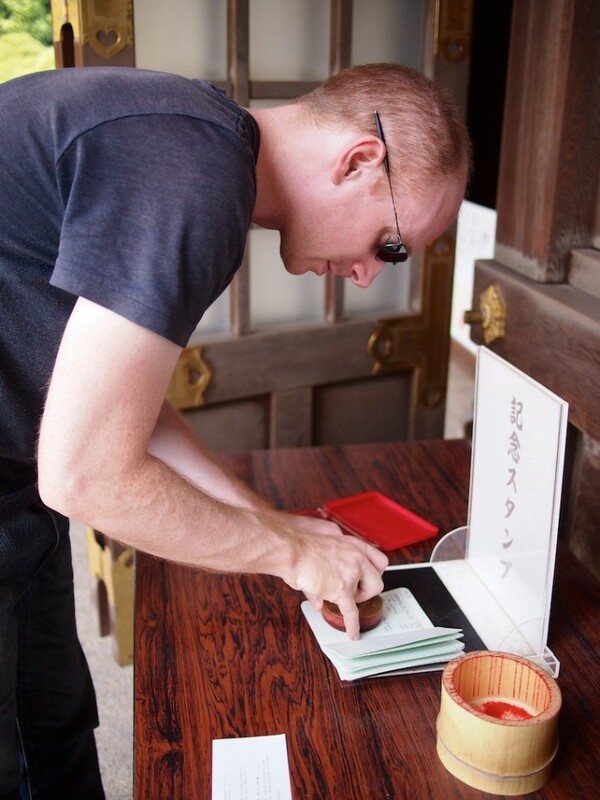 Top tip for visiting Japan – take a small notebook with you to collect the stamps in! Business hotels often provide yukata, which are simple wrap-style Japanese nightgowns, and slippers. 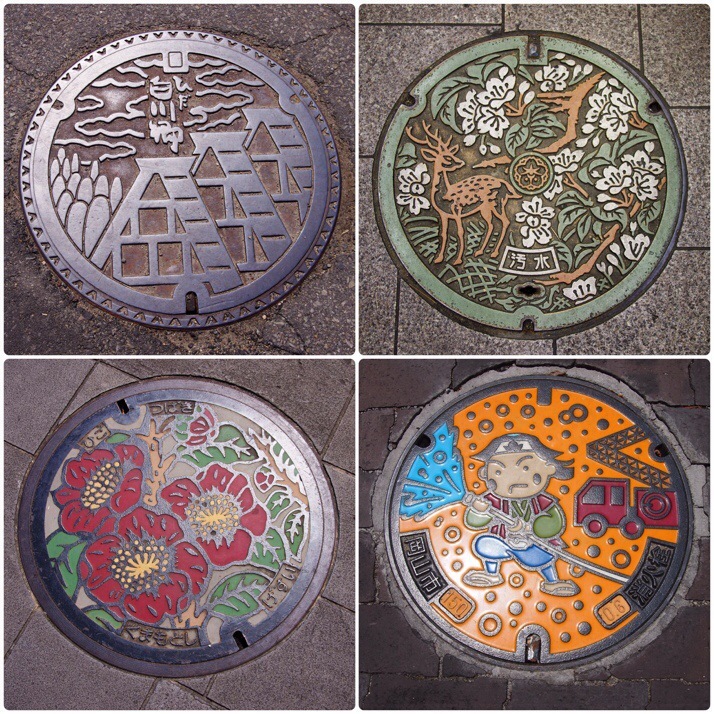 Manhole covers are often specific to the town, city or area, and have wonderfully creative and colourful designs. 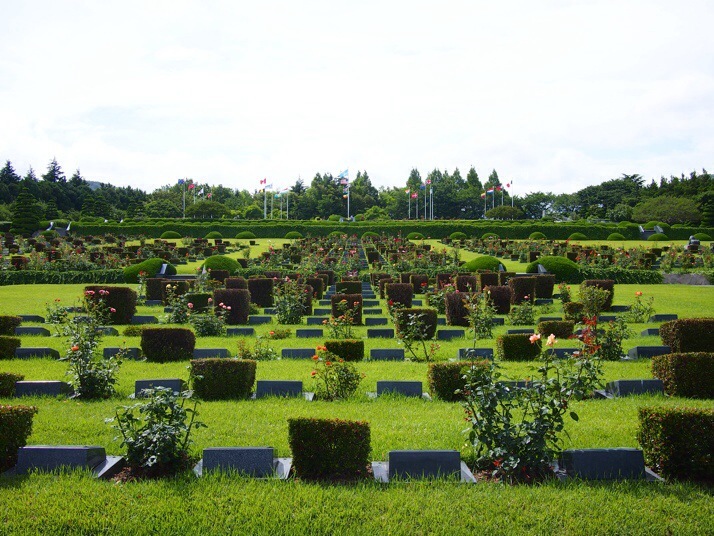 As well as the fantastic public gardens, we’ve found that the Japanese take great pride in the appearance of their private gardens too. We’ve yet to see one that wasn’t beautiful and well organised. 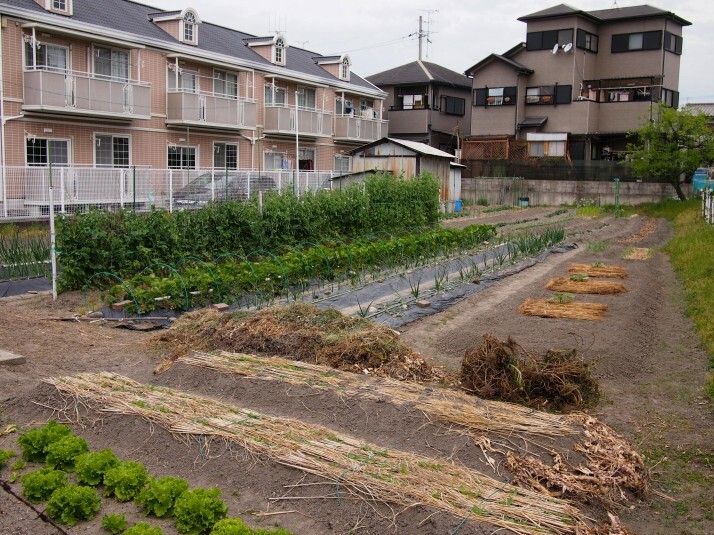 The same goes for their allotments! 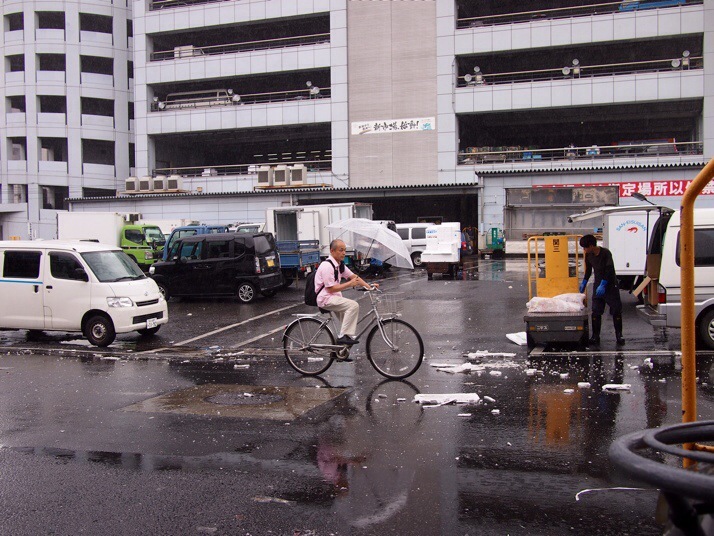 The Japanese love their bicycles. They like to ride them on the pavement, they rarely have lights (or if they do, they rarely use them) and when it’s raining, they can cycle while carrying an umbrella! More people smoke than we were expecting, and smoking in restaurants and bars is still permitted. There are restrictions being applied to shopping centres and streets, and some restaurant chains have glassed-off smoking areas or are completely non-smoking. Japan is a very safe place, and there’s very little theft – we even saw people leave their cars running with the doors unlocked and windows open outside convenience stores while they nipped inside! 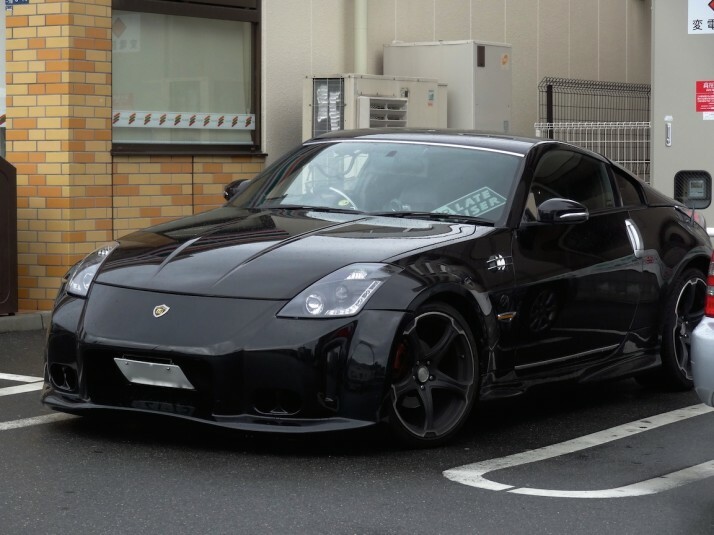 This max’d out Nissan 350Z was left running in the car park of a 7-11 while the owner nipped inside for a pack of cigarettes. We saw so many cars left running outside shops, and delivery scooters with the keys in them! Digital cameras and camera phones are required by law to make a shutter noise, to deter sneaky snapshots (source). Fruit and veg are priced per piece and not by weight, including apples, onions and even potatoes! .. and speaking of apples, they’re huge, like the size of lawn bowls huge. School seems to be more day trips than sitting in classrooms because we saw so many groups of schoolchildren visiting historic sights and museums. 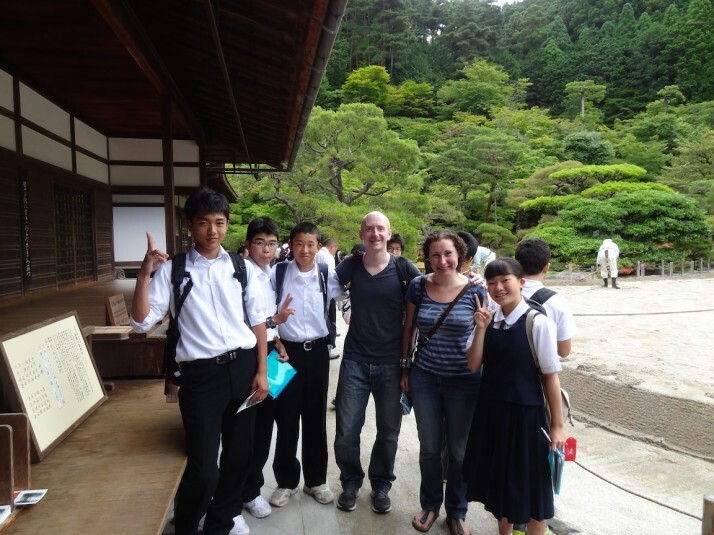 Us with a group of schoolchildren having just practiced their English with us in Kyoto. 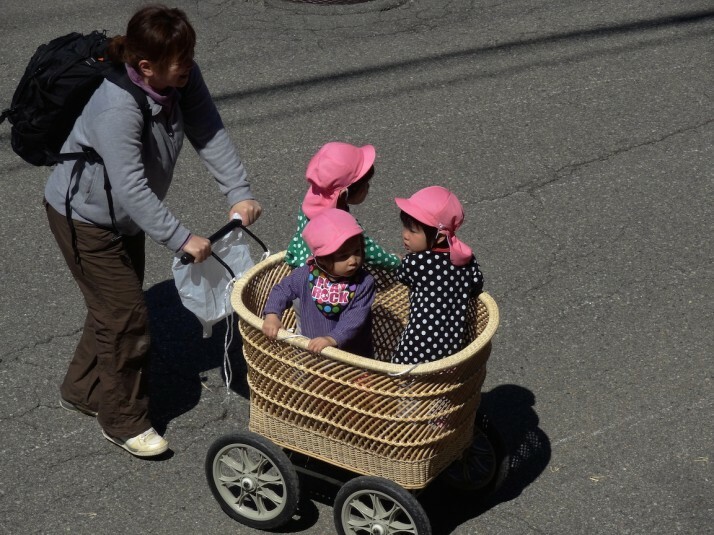 We saw so many groups of kids that school in Japan must consist entirely of day trips! Cash machines only dispense ¥10,000 (£60) notes, but we’ve never had trouble getting one changed even in small shops and restaurants. Babies and toddlers are often transported in trollies! Can you think of a suitable caption? Post a comment below! Street maps are already orientated, which is very handy once we’d realised it, but we were initially confused why North pointed in seemingly random directions! 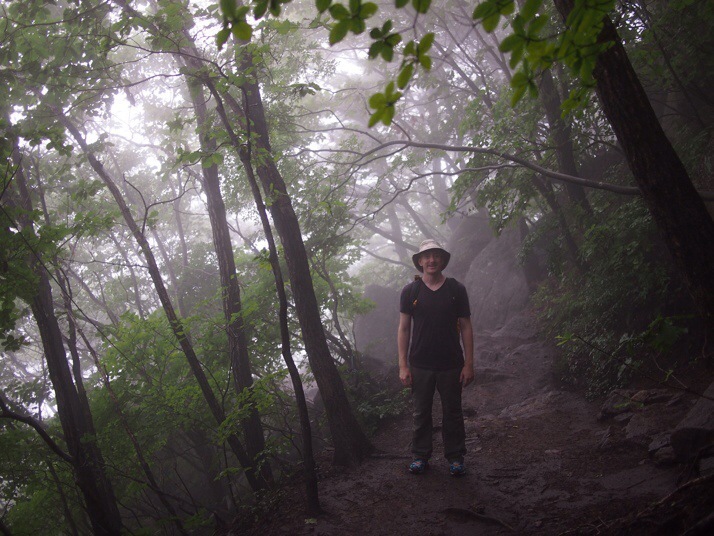 This entry was posted in Experiences, Travel and tagged Japan on July 18, 2014 by Andrew.